• This Was Actually How The Redskins Wanted To Bring Joe Gibbs Back, But He Thought It Was Permanent, And Nobody Had The Heart To Tell Him Otherwise — This story about Al Arbour coaching the Islanders again after 13 years to round out his coaching career at an even 1,500 seems pretty cool, doubly so that he won. But imagine if the Islanders lost the game. Picture them out of the playoffs by one game. Hypothesize the credentialed bloggers having a field day. 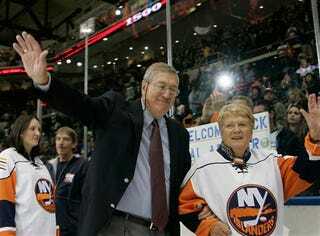 Especially with, I'm guessing from the picture, Arbour put his wife in at left wing. Fortunately, the arcane lore stored inside Coach Arbour's head was enough to stave off the Pittsburgh Penguins in a 3-2 victory. • It's A Good Old Fashioned Mediocre-Off — Nobody else can be the .500 team floundering in the Atlantic Division. That role is taken by either the Devils and Rangers. It took a shootout to determine which team is more adequate. The lone shootout goal was netted by Petr Prucha of the Rangers, which means New York hung on to win 2-1 over the Devils. • Canadian Government Takeover — How come nobody is talking about the Ottawa Senators? ...oh, right. Because the NHL has fallen off the mainstream coverage. I keep forgetting that. Chuck Kobasew's back-to-back goals in the second period for Boston were equalized by consecutive power play goals, courtesy of Dany Heatley and Mike Fisher, and the Senators passed a resolution in favor of a 3-2 win over the Bruins. Ottawa is 11-1-0. • Wild Card. Draw Four. The Color Is... Green. By The Way: Uno. Jerome Iginla scored a goal. That's nice. But Minnesota had four goals, which is three more, according to my second grade flash cards. The Minnesota Wild's 4-1 win over Calgary moves them back into sole first place of the Northwest Division, because Colorado lost. • ____|\_____\o/____ AHHHH SHARK!!! — Jeremy Roenick scored his 499th career goal as his San Jose Sharks won 3-1 over the LA Kings. 15 years from now, caretakers will wheel him back into an NHL game, where Roenick will hopefully score his ceremonial 500th and receive a complimentary oversized banner.